Come along and contribute to the third in a series of discussions on Capitalist Realism by Mark Fisher, continuing with chapters 6-7 (pages 43-65) on bureaucracy, dreams and memory. This book club is facilitated by Silvia Bombardini and Elliot Mason. 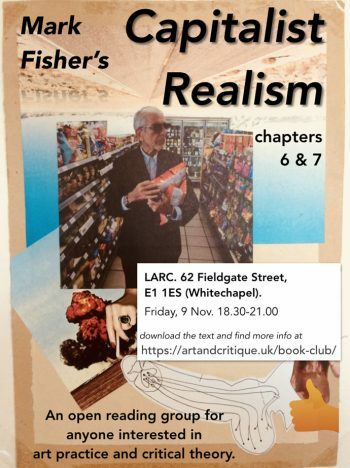 Fisher: Capitalist Realism Pt.3. Flyer by Elliot C. Mason. Mark Fisher’s short book Capitalist Realism is one of the twenty-first century’s great reactions to the material horrors of neoliberal capitalism. It guides us through the precarity and meaninglessness of contemporary work, epitomized by the endless web of the call centre. Everything is mediated, passed on to someone else, abstracted from our tangible grasp. “Work and life become inseparable. Capital follows you when you dream. Time ceases to be linear, becomes chaotic, broken down into punctiform divisions”. All material bases of the system are abstracted, and the possibility of an uprising, as Maurizio Lazzarato warns us, are divided and broken. We cannot fight back, because there is nothing to fight, only the physical oppression of capitalist culture keeping us in check. Chapters 6 and 7 of Capitalist Realism attempt to provide practical ways of improving this situation. The main possibility considered is education reform. The pointless practices of call centres are duplicated verbatim in school and university checks by organizations like Ofsted. Teachers and lecturers are required to spend most of their time creating simplistic Powerpoint slides that ensure every student is kept as bored as possible so they hate education and leave it immediately, shimmering off into the reproduction of capital rather than learning the logic of their oppressor. Grassroots, collective, radically free and accessible education is only the first step towards a viable and full alternative to neoliberal education. The other big theme of these chapters is the Big Other – psychoanalyst Jacques Lacan’s term for the collective fiction any society invests in: for example, the collective fiction that companies are well-meaning and provide necessary entrepreneurship to society, while privately we all recognize (without the awareness of the collective fiction) that the hallmarks of success in and for a company are ruthless, brutal exploitation and evasion of all social responsibility. Mark Fisher questions the claims that postmodern capitalism is beyond belief, no longer tied to a symbolic ‘Big Other’ narrative. In fact, it seems we do have a universal capitalist cultural belief, but what it mostly tries to convince us of is that all the idiots in the past were the only ones who really believed, while we are emancipated from that and now allowed to simply consume commodities, free from all ideology, without allowing the suggestion that the constant consumption of corporate commodities is itself a very gagging and binding ideology. In this book club we will discuss these two chapters, pages 43 to 65, relating the philosophy to everyday life, thinking about what has changed in the nine years since the book was published, and asking questions like: Would an entirely independent and autonomous education system work in producing equality in output? What is the Big Other in education and how can we make it aware of itself? Is our collective reading of a text like this already a step toward the Big Other becoming aware of itself or does capitalism need us too? Would an entirely independent and autonomous education system work in producing equality in output? What is the Big Other in education and how can we make it aware of itself? Is our collective reading of a text like this already a step toward the Big Other becoming aware of itself or does capitalism need us too? Have immovable realities disappeared from our perception, or is it a western-centric argument? Are we nostalgic toward the familiar, or toward novelty? Is the autonomous force of an image in capitalist culture the cause or effect of bureaucratic immediacy – the sacrifice of the long-term in the past and future?